Despite extensive searching, I could find almost no information concerning Arthur Edgar Wills. It appears that he was born in Yeovil at the end of 1884 and in the autumn of 1915 he married Annie J Forward in Yeovil. But that's it, I could find no further trace of either of them until Arthur enlisted. It is known that Arthur enlisted in Yeovil although the date is unknown. He enlisted in the Royal Field Artillery as a Gunner. His Service Number was 133355 indicating that he enlisted later in the war, probably during late 1916. At some point he joined 'A' Battery, 110th Brigade, Royal Field Artillery. This brigade was originally comprised of A, B, C and D Batteries RFA and the Brigade Ammunition Column. It was placed under command of the 25th Division. The batteries were all armed with four 18-pounder field guns. The brigade then remained with the division throughout the war. On 26 May 1916 the Brigade Ammunition Column left, being merged into the 25th Divisional Ammunition Column. On 31 May 1916 D Battery left, becoming the A Battery of 113 Brigade. The D (Howitzer) Battery of that brigade joined in its place. On 26-27 November 1916 the field gun batteries were made up to six guns each: C Battery was broken up and its two-gun sections joined A and B Batteries respectively; a new C Battery was formed from A and half of B Battery which arrived from 111 Brigade. The 25th Division was engaged during the Battle of the Somme in 1916. In May 1917, it took part in the Battle of Messines. Arthur Wills service is not known in detail. He died from his wounds on 1 May 1917, he was 33 years old. 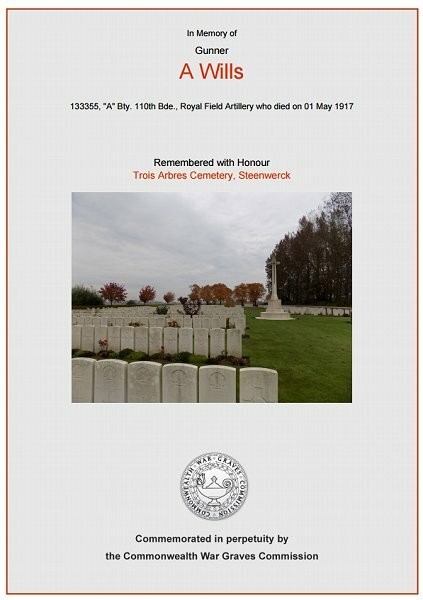 Arthur was buried at Trois Arbres Cemetery, Steenwerck, France, Grave I.J.4. His name was added to the War Memorial in the Borough in 2018. The Commonwealth War Graves Commission certificate commemorating Arthur Wills.